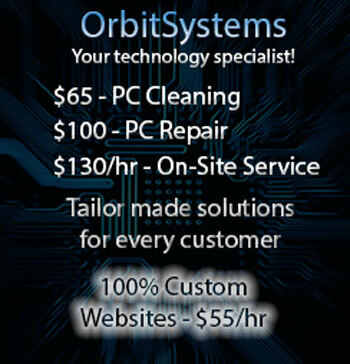 OrbitSystems Technology Solutions - Over 22 Years in the industry! OrbitSystems is a premier technology solutions provider. Specalizing in all manner of residential/commercial computer hardware, software, networking and data recovery, as well as Web/Mobile Application Development. We at Orbit Systems strive to be the best, through stronger partnerships with Customers, and responsiveness to their immediate and long term REQUIREMENTS. Orbit Systems promotes Quality through TOTAL CUSTOMER SATISFACTION, and better understanding of each customer specific needs.